Here at Blackjack.com.au, Casino-Mate has been one of our longest running favourite blackjack sites and now there’s more reason than ever to play at this renowned casino. Casino-Mate recently underwent a fancy new facelift, enhancing the graphics, usability and general functionality of the site. The results have been spectacular, with Casino-Mate now resuming its place as one of the best real money blackjack venues on the Web. Games at Casino-Mate are now accessible either directly over your web browser, or by downloading the free premium casino software. 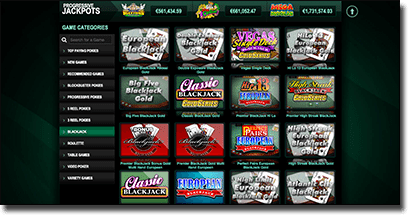 A selection of blackjack titles are also available at Casino-Mate’s mobile casino for iOS and Android users. Whichever way you choose to play, Casino-Mate makes it easy for Aussie players to enjoy real money games in one safe place. As part of the revival, games are now incredibly easy to find using the clearly labelled game category tabs. You’ll find the blackjack tab down the left hand side of the screen nestled amongst the pokies and roulette. If you know the name of the 21 variant you’re looking for you can simply type it into the search magnifier bar. And that’s only naming a few! 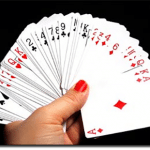 There aren’t many other online casinos that offer this many variants of 21 while also ticking all the right boxes when it comes to security, deposit options and user-friendliness. 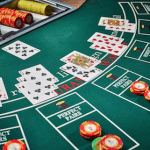 If you want to take a break between blackjack hands, there’s plenty of other game types to choose from including pokies, roulette, video poker, baccarat, craps, poker and variety games like bingo and scratchies. If you’re not yet a registered player at Casino-Mate, follow our links to visit the newly enhanced site and sign up to receive a welcome package of up to $1,400 in matched deposit bonuses with a side of 30 free spins. If you’re already registered with Casino-Mate but it’s been awhile since you played at this site, it’s definitely time for another visit, take our word for it. During November there’s also a huge promotion happening at Casino-Mate to celebrate the release of the new Microgaming pokies title, Basketball Star. Take five between blackjack games and try a few spins on Basketball Star to be in the running to win a trip for two to New York City to watch the Brooklyn Nets play the New York Knicks, or to score some sweet Apple prize packages. For full terms and conditions of the Basketball Star promo, follow our links to visit Casino-Mate’s new and improved site and see how you can be in the running.